candidates for Assistant Superintendent, Technical Assistant, Diploma Trainee, Office Assistant, Store Assistant, Unskilled Grade and other vacancies. The total no of vacancies available in GSL Recruitment are 147 posts. 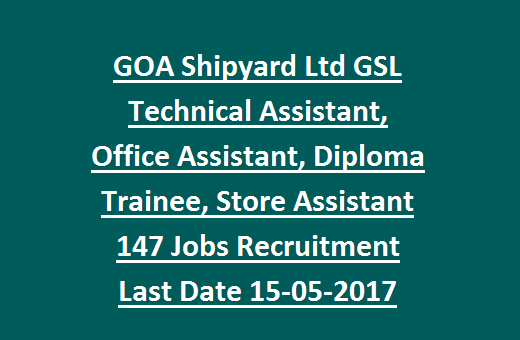 Interested candidates may apply online for GSL Recruitment jobs using Goa Shipyard Ltd official link @ www.goashipyard.com. Online Application link activates from 16/April/2017 till 15/May/2017. After completion of online applications candidates are required to send the printout copy with all documents before 25/May/2017. GSL Recruitment Technical Assistant, Diploma Trainee, Office Assistant Jobs will be filled through written test/ interview. For more details of GOA Shipyard Ltd GSL Recruitment 2017- Eligible criteria, qualifications, age limits, Pay scale and Application procedure are given below. GSL online application link opens from: 16-04-2017. Last date for submission of online applications: 15-05-2017. Last date to send the receipt of application: 25-05-2017. There are total 147 vacancies available in GSL Recruitment 2017. 1. Asst Superintendent: 10 posts. 2. Technical Assistant: 37 posts. 3. EDP/ ERP Asst Grade II: 02 posts. 4. Civil Asst Grade II: 01 post. 5. Office Assistant: 10 posts. 6. Jr. Hindi Translator: 01 post. 7. Commercial Asst: 09 posts. 8. Diploma Trainee: 11 posts. 9. Trainee Shipwright Fitter: 04 posts. 10. Trainee Machinist: 02 posts. 11. Telephone Operator: 01 post. 12. Store Assistant: 09 posts. 13. Yard Assistant: 01 post. 15. Auto Electrician: 01 post. 16. Record Keeper: 01 post. 18. Vehicle Driver: 06 posts. 20. Mobile Crane Operator: 02 posts. 21. EOT Crane Operator: 03 posts. 22. Unskilled Grade: 25 posts. Upper Age limit for GSL Jobs is 33 years as on 31-03-2017. Please see the notification for Upper age relaxation of OBC/ SC/ST/ PWD candidates. Selected candidates will be paid monthly salary as per Government rules, see the notification for post wise pay scale details. Applicant must have passed 10th class/ 12th class/ Diploma/ Graduation degree or its equivalent qualification from any recognized university. For post wise qualification visit GSL notification. Eligible candidates will be shortlisted based on their performance in written test/ interview. 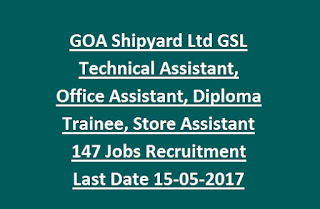 Candidates may apply for GSL Recruitment vacancies using GOA Shipyard Ltd official web portal @ www.goashipyard.com. Submit the filled application with all required document before 15-May-2017. After successful completion of online application take the printout copy and send to given address before 25-May-2017.